I have to admit, the first thing that drew me to this book is the amazing cover. I am such a sucker for a beautiful book. Claire Vaye Watkins is the award winning writer of short story collection Battleborn, which aside from sharing its name with an album by The Killers I know nothing about... but now that I have read Gold Fame Citrus I will definitely be checking it out. 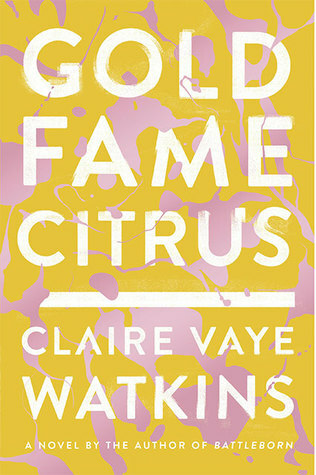 Gold Fame Citrus is the story of Luz (pronounced Looz as far as I can tell) and Ray, who have stayed behind in California after most of the residents of that state have been evacuated due to vast environmental disaster. There is a shortage of water, one which has caused a massive 'dune sea' to form, and those who survive out there do so on very little water (although who provides these rations I am not entirely sure. I assume the Red Cross. They are mentioned.) Luz and Ray are in love, and living in the abandoned mansion of a Hollywood starlet. They are just trying to keep busy. Ray prescribes projects to keep their minds straight, so Luz spends her days reading obscure books by explorers from the starlet's library and trying on her fancy clothes, none of which have any uses any more. Ray's jobs are more practical, such as digging latrines, and looking after Luz. Ray needs to be needed by her. It is how they function. One day, they find someone else to need them. A child, possibly around two years old, and in the company of a rag tag and scary bunch of teenagers. Her name is Ig, and she latches onto Luz like she's met her somewhere before. Perhaps it is maternal instinct and perhaps it is boredom, but Luz is convinced that Ig belongs with them. So they take her and they take off. Their only chance of a good life is to join the rest of the nation. Although... there are rumours that somewhere out in the dune sea there is a dowser, a man who can find water, and can keep his people free from needing the handouts provided by the government. It's very hard to explain this novel but the closest thing I can liken it to is a cross between Margaret Atwood's Oryx and Crake and Cormac McCarthy's The Road. It's easy to tell that Watkins has honed her craft on short stories. Her language is playful but precise and her experimentation with different forms reflects the chaos of the situation faced by the characters. At times, I felt a few of the shifts of point of view disorienting, particularly when more than 90% of the book is told in third person and limited to Luz's point of view. There are sections of the book which don't feel like they belong to the book at all, such as the chapter set in the town above the mine, where a 'mole man' joins their midst. The significance of this scene can only be guessed at, and while I have my explanation, I feel the book would sit just as well without it there at all, as it raises more questions than it satisfies. The emotional range of this book is very complex, and the character Luz undergoes a journey of self realisation before the eyes of the reader, refreshing given the proliferation of books written today where the characters neither grow nor change over the course of their stories. I find Watkins' creation of Ig, the toddler found by Luz and Ray to be the most interesting, as she seems to possess mystical significance that is never grasped by any of the people she comes into contact with, and one can never be sure if she is really an omen in human form, or just a slightly messed up child. It was immensely satisfying to be reading this book last weekend, when temperatures soared in Perth, leading into a harsh summer. I felt the character's situation on my skin, and while it was uncomfortable, it was real and I enjoyed being immersed in their story. Competent writing but I didn't quite get into it for no fault of the author's.